A pioneering craft in planetary science soon will celebrate its 10th anniversary. The rover Opportunity roams the surface of Mars alone, but its creators on Earth remain enthralled with what the craft discovers. Opportunity left Earth in 2003 and landed on Mars for what was planned as a 90-day mission. The rover’s sustained operation beyond its original mission is like driving a car 3 million kilometers without an oil change, one NASA official told reporters. Opportunity has studied the sedimentary rocks of Botany Bay, above, and travels on to the ridge in the distance. The rover will sample rocks from the strata indicated in Solander Point, which are likely to reveal how conditions on Mars have changed across time. 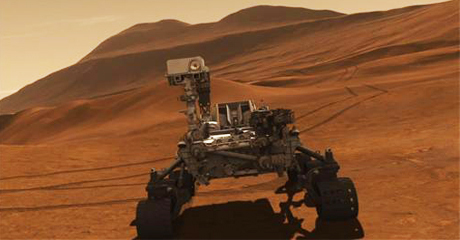 The rover Opportunity, and the twin craft Spirit, both completed their prime missions in April 2004, but continued operating in extended missions. Spirit stopped communicating with Earth in March 2010. With Opportunity’s unexpected longevity, scientists say each day is like a brand new mission. Since 2004, the rovers have detected evidence of wet environments on ancient Mars. Opportunity recently analyzed surface material revealing that Mars’ water was chemically neutral and favorable to support life.